Recent events have proven that, despite common belief, humanity does not fully understand its own world. Though we have a long history filled with explorers and adventurers who have incrementally pushed back the uncharted edges of the map, Earth still finds ways to conceal its full majesty and its many dangers from us. The depths of the cold oceans, the untamed hearts of the jungles, and the shrouded valleys between imposing mountain peaks still guard their secrets. Omura’s whale, the coelacanth, the Javan elephant. . . these are creatures humanity mistakenly thought had long since become extinct, only to later discover they were alive and well. But one of the firmest held beliefs of the paleobiological community—the KT Extinction—seemed impervious to the discovery of such Lazarus species. 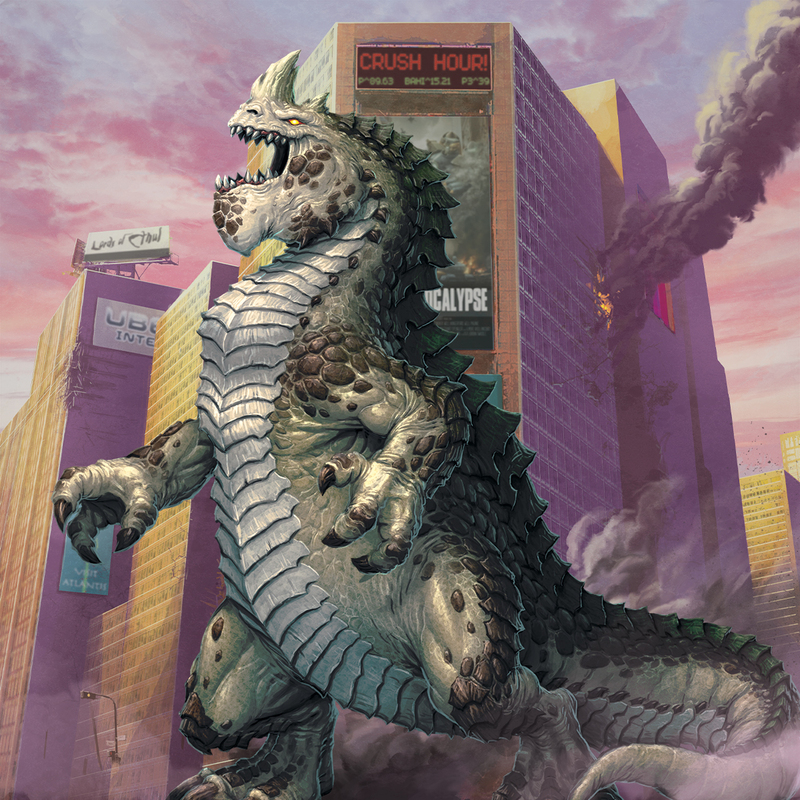 That is, until the onset of the Monsterpocalypse and the return of the Terrasaurs. What follows is an excerpt from Brazilian researcher Paulo Silva’s field journal, recorded in Vale do Javari, a protected region of the Brazilian rainforest containing at least 14 uncontacted indigenous tribes. Marco and I followed them from a distance to avoid being spotted. I hoped they would lead me to a village, where I could observe them engaged in religious practice. I do not adhere to the popular thought that the Dslala lack a capacity for faith. Madre, that seems impossible to imagine. I do not know what it is they led us to. Or at least I do not understand. At first, I thought it was the ruins of a previous civilization. Perhaps some fragment of the Marajoara people spread too far to the west. But the stones were too large, too ornate, and unlike any Marajoara relics I have seen. No, these stones were far older, far grander, than anything I have yet encountered. They make Ollantaytambo look like a garden wall. But the structures—no, the city—was the least of what I saw today. The Dslala walked to a great stairwell as wide as a city freeway and began to chant. I believed I was watching the first evidence of religious ritual among these people, as they joined voices to call down into the stairwell that descended into the earth. I admit my grasp of their language is imperfect, but I heard them calling out to the great king of the soil, the hungry beast of the earth. Could this be the Planet Eaters? I wondered. But how would this tribe have learned of them, living without contact from outsiders for so long? Surely they did not see the Planet Eater attack on Buenos Aires? I thought they might have been referencing some old god of the Dslala, some primordial power to match the horrible Cthulians that arose in the Middle East. The chanting lasted through the day and into the night. Every so often, one would descend into the earth and would not return, until a time that only one remained chanting into the darkness. That is when it happened. The earth began to shudder, to shake, as my hand does while I write these next words. The old temple heaved from beneath. I suspected an earthquake and begged Marco to remain still, lest one of the stones fall loose and crush him. I cannot describe what I saw. It was as though the bones of the world rose up, as if the planet itself gave birth to a beast to defend against the violence of the destroyers. It gave up a sovereign ruler from the soil, drawn forth from the mists of time to protect it from devastation. It gave birth to Terra Khan. As to where it had come from, how long it had waited there, and why it answered that call, I do not know. That chanting expressed a need, a cry for help, not of the Dslala alone but all of us who have been assailed by horrors. It was Terra Khan, and the other great and forgotten beasts of the ancient world, that answered. [KS] RGG 360° miniature handle: Cool offer!